The Cherilea toy company was formed in 1947 in Burnley, Lancashire, by the former chief designer of well-known hollowcast soldier maker Johillco, Wilfred Cherrington, and his less well-known partner, a Mr. Leaver: the company name was an amalgamation of their surnames. The company initially specialised in die-cast military toys but increasing post-war demand for toys and metal shortages forced a switch over to plastic production in the late 1950s. 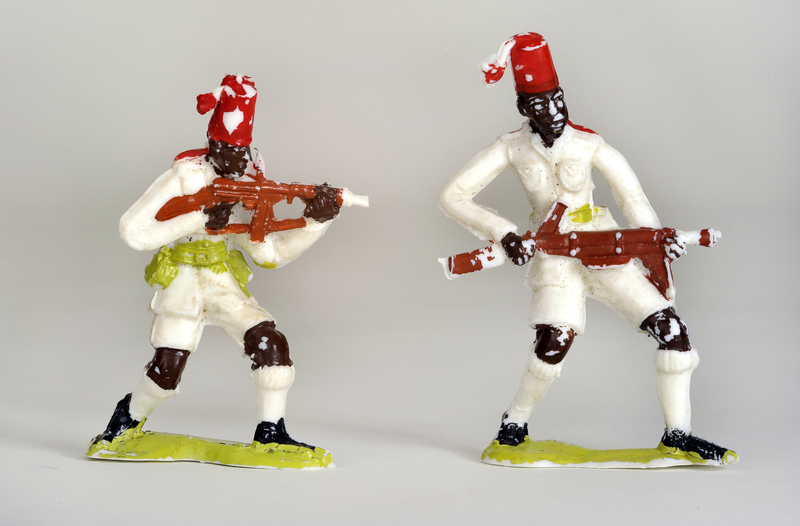 Cherilea toy soldiers are characterised by their individual style. 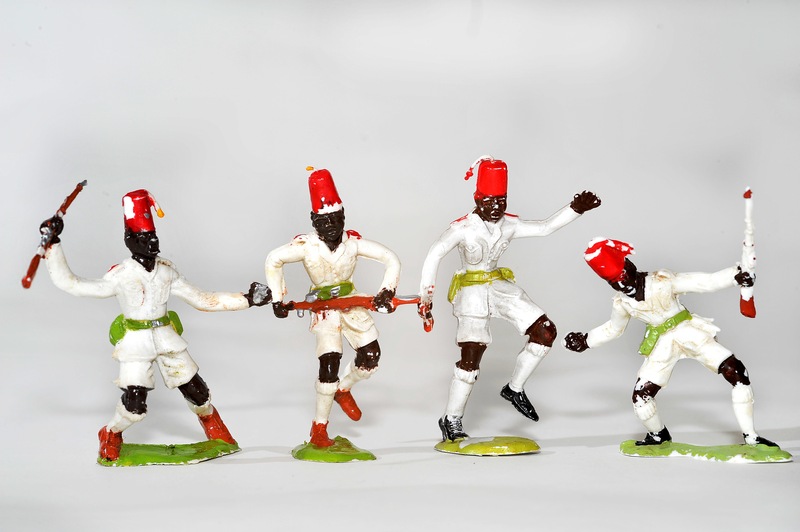 Their set of six 60mm plastic figures of the King’s African Rifles are parodies rather than accurate depictions of the troops. Therefore, it is interesting that the weapons they are carrying are portrayed with sufficient accuracy to identify one almost certainly as a Thompson sub-machine gun (above left) and another as a Bren gun (right). The British used the Bren light machine gun from 1937 until the 1980s, but the Thompson “tommy gun” was only brought from America in 1940 and removed from service shortly after the Second World War ended in 1945. This neatly dates the period these soldiers represent to the Second World War. The remaining figures of the Cherilea set carry rifles. These are almost certainly intended to be Lee Enfield 0.303 SMLEs which were in service with the KAR in various marks from the First World War until most battalions received 7.62mm L1 Self Loading Rifles (SLRs) in the late-1950s. Despite their slightly grotesque appearance, the Cherilea figures have more character and interest than many of the plastic toy soldiers that followed them in the 1960s and 1970s. Click here for more about Uniforms of the KAR. This entry was posted in Old Toy Soldiers by askari373. Bookmark the permalink.